Enough of cheesy MIDI keyboards faking instruments. Yes, it looks embarrassing. Here’s something entirely different. On the subject of the Haken Continuum, a single, touch-sensitive, continuous-pitch instrumental controller, we can see in a video just how expressive it can be. 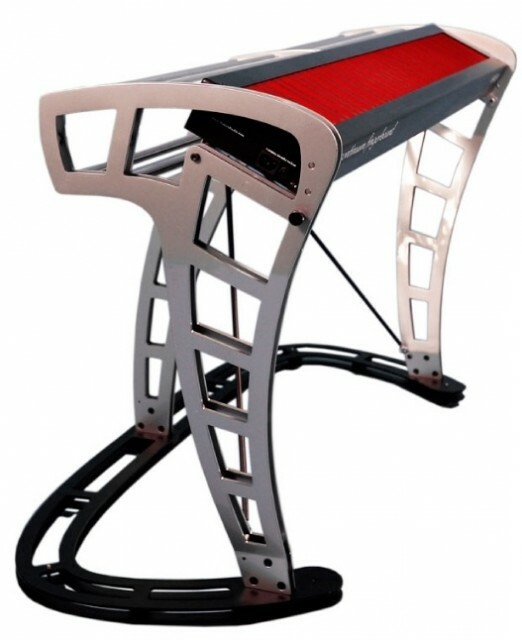 The Continuum Fingerboard consists of a large, soft playing surface. Press in with your fingers, and three-dimensional sensing responds in pitch and timbre. The range is even greater than an 88-key keyboard in the full-sized model; an optional stand holds it steady (and would look at home on the deck of a Klingon warbird). The instrument, full of carefully-crafted custom engineering, is pricey, however: US$3390 gets you a half-sized model, or $5290 for the full model. But for that money, if you’ve got it, you get a digital instrument resembling something more like an acoustic instrument, and by that standard, it’s a bargain. Because it’s intended as a controller, that expressive power means little until you pair it with a similarly-responsive sound. And for that, there’s a sophisticated, grain-based, fully-modular sound engine with vast sound capabilities all its own. In fact, the sound engine itself — dubbed Eagen Matrix, after its creator Ed Eagan — is perhaps the most underrated element of the Continuum system, even though the two are designed to work together. In the video, Ed himself shows us around the patch and its capabilities. Roger Linn actually points us to this video, as he notes his admiration for the Continuum – and showed this off at Moogfest last week. I play this video at all of my LinnStrument talks, including the Moogfest one. In my view, this is far and away not only the finest example of polyphonically expressive capabilities on an electronic instrument, but also the finest example of a polyphonically expressive traditional instrumental performance on an electronic instrument. When I played this video at Moogfest, it got a huge round of applause. It is worth noting that Continuum was first sold in 1999, which speaks very highly of Lippold Haken’s profound forward thinking and design creativity. There’s a modular digital synth to go with that Continuum – and it’s capable of some incredible sounds. I think it’s even more encouraging to see the Continuum alongside the Linnstrument. If the Linnstrument gets closer to the US$1000-1500 range, it would be in reach of those who can’t afford a Continuum – and offers a portability solution and hybrid with square pad performance paradigms. But with more of these sorts of instruments (the Madrona Soundplane being another fine example), we begin to reach a critical mass of expressive instruments. Just as modular synthesizers have grown in success as they’ve multiplied, a greater range of expressive controllers could transform the category from outlying edge case into something with its own scene. And that seems long overdue. And just as some people are immediately drawn to a violin, others to a double bass, I imagine these choices only provide more opportunities for would-be players. Haken Audio’s Continuum EaganMatrix Expander (CEE) provides increased polyphony for EaganMatrix sounds. The EaganMatrix Expander triples the computation power of the Continuum Fingerboard, thereby tripling the polyphony of EaganMatrix sounds. This increased polyphony is most useful for EaganMatrix sounds that require polyphony greater than the number of fingers simultaneously touching the surface, such as percussive sounds with releases that continue to sound after the finger is lifted from the playing surface. Combined with associated updates to firmware and software, the updated package was on view at the booth I shared with Haken at ALEX4 at Musikmesse in March. This video is a demonstration of the VlnVlaCelBass sound on the Continuum Fingerboard, performed by Edmund Eagan. This EaganMatrix string sound has been programmed to take advantage of the Continuum’s fast and accurate pressure sensing. Playing this sound with low velocity finger movement will create a smooth gentle start to each note. After the note starts volume and timbre changes can be applied by changing the pressure on the surface. When played with a harder finger velocity, the sound gets more aggressive in it’s attack. This is due to the inclusion of timbre data that represents a real string attack. The name of the sound includes the four names of the orchestral string family, violin, viola, cello, and double bass, reflecting the combined pitch range of these instruments. The sound is equally convincing and expressive at all pitches, even at the extremes. Pressing the first foot pedal activates a mono mode which makes it easier to play fast monophonic intervals, such as whole tone or minor third trills. The overall tonal character of the instrument can be changed by moving the Size barrel. Lower values of Size will create a larger sounding instrument, higher values a smaller one. The VlnVlaCelBass uses the GrainSilo in the EaganMatrix, with a timbre element called Vla Sustained. The original source for this timbre element came from the first 100 milliseconds of a single note preformed by Rudolf Haken on a Pellegrina 5 string viola. This 100 milliseconds contains essential attack and sustain spectra. Through the power of the EaganMatrix formula structures, control of the timbre elements reference point, fundamental, spectral rolloff, spectral shift, and amplitude is mapped to the playing surface. The three dimensional performance of each finger can translate into exquisite control of this finite piece of data.